Home > Blog > Heathrow Expansion – The Enthusiasm of Residents. Heathrow Expansion – The Enthusiasm of Residents. There have been a lot of campaigns to support Heathrow Expansion. But Pro-Heathrow Campaign scored the goal. These campaigners from West London gathered in front of the Parliament Houses on 2 Feb, to convey their support. 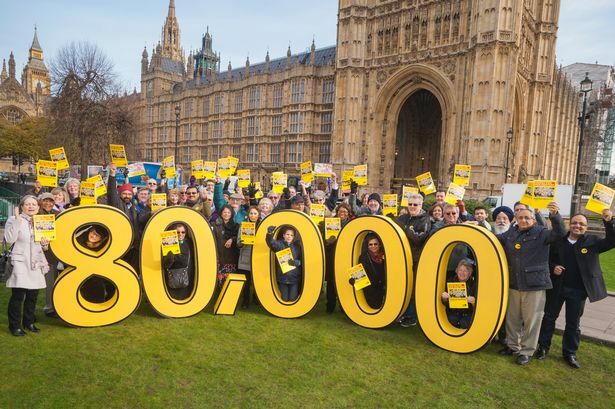 There were tens and thousands of people from every age group traveling from Hounslow and Westminister to hand their responses of YES to Heathrow expansion. They used posters saying “Proud to back Heathrow” and giant “80,000” placard. “The silent majority are now speaking out in their thousands, determined to see that growth at Heathrow is delivered by politicians. Surinder Singh Benipal, owner of the Hounslow Heath Post Office, said: “We should definitely get a new runway at Heathrow as soon as possible because the airport has got to saturation point. “I live near the flight path so I know about noise but it provides jobs and helps our community flourish. Jas Sanghera, who lives in SouthHall, added: “I believe that economic sustainability and employment is the bedrock of any community. “Heathrow is the blood line of our community in west London and without it the consequences would be disastrous. “Doing nothing is not an option if we are to meet the needs and aspirations of our growing population. Gary Dixon, from Hillingdon, said: “I’ve lived near the airport for years. Heathrow expansion would be fantastic, bringing more jobs to the area. If the decision of expansion was up to the resident community, Heathrow would have a strong back. But so does Gatwick, where the Crawley council dismissed the people’s opinion about expansion. If the motion of Heathrow expansion is carried, there will be a definite increase in business in the area. It would also require an expansion of services that are currently emplaced at the airport including the extravagant Car Parking Services at Heathrow Airport. Previous PostGatwick Expansion – All those in the favor, say AYE…!Next PostHow to Beat the Airport Parking Monster?